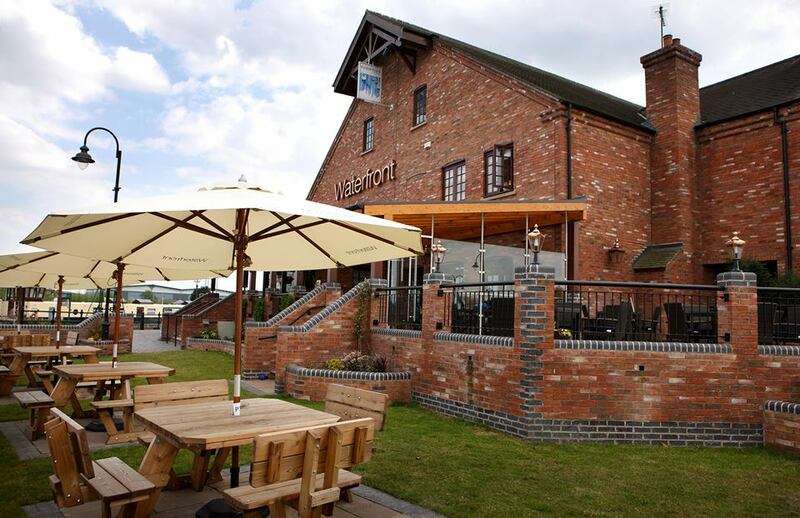 The Waterfront pub opened in 2007. With the inspired use of reclaimed timber and brick, stone flags and period lighting, this privately-owned free house replicates the style of a Victorian canal-side warehouse. The vaulted bar serves an extensive range of real ales, premium lagers, fine wines, cocktails and malt whiskies. 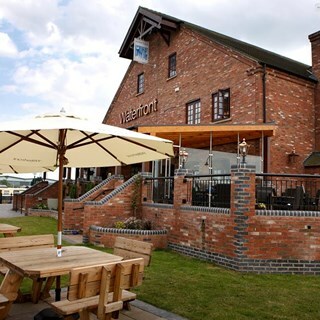 Sensibly priced pub food, freshly cooked to order, is served in the restaurant, bar and lounge, and on the terrace overlooking the idyllic 300-berth Marina. The 50-seat contemporary conservatory, known as the Quarterdeck, is popular with diners and for private parties. On the first floor, the Crow’s Nest function room is available to hire for weddings, celebrations or for business use. This spacious and elevated room boasts a dance floor and a well-stocked bar, and the open balcony offers splendid views across the marina. Children over five years-of-age are welcome until 7 p.m.
Children over fourteen may dine with an adult after 7 p.m. The food was acceptable, slightly overcooked steak and chicken. Staff were busy but appeared to bustle, too fast for a dining area. All staff referred to myself and my elderly parents as "guys", not something I or they appreciated. Certainly not as good as my last experience. We were served by Jordan - who was fantastic. Plus - very glad to know that we’ll behaved teenagers are now welcome in family parties as this has put us off for a long time - we are a large family with grown up children with partners. We have never felt welcome before as we also have a fourteen year old (although with excellent manners). Food was great, but a pint of Peroni £4.90. We all work and are not hard up, but we all remarked on the cost of the drinks and will think twice before we come back for a meal. Loved the location, the menu and the atmosphere, with friendly and efficient staff too. Food excellent though expensive Service slow we waited up to 1/2 hour to be served first course. Considering when you book you are informed you have to vacate your seat in 2 hours. It will take you up to 3 hours if you ordered a 3 course meal ! The bread and butter pudding was to die for!! Nice surroundings. Would like to see a bit more variety on the menu. Food is always of high standard never been disappointed. Service recently has been excellent although sometimes wait a while for you first drink when your seated. Always enjoy going to the waterfront. It has to be the worst meal experience we have had in a long time. Table was reserved for 3pm stood there waiting while a table was put together hastily 10 minutes later. Ordered drinks and Sunday lunch for 4 people. The cup of tea came and 10 minutes later our other drinks hadn't arrived. Asked a waitress, waited another 10 minutes for the drinks. After an hour and 10 minutes we still hadn't received our meals (how hard is it to put 4 Sunday lunches up) We were about to leave when the meals arrived. I wish we had left as my meal was not hot, tepid at best. The thought of sending it back and waiting another hour for it to arrive I decided to eat it. My Mom's meal had charcoal bits in it. You won't be surprised to hear we didn't have dessert and will be telling everybody we know not to go to The Waterfront for a meal. Even though I had to put one star it's really no stars for everything. Awful. Fantastic food,service and atmosphere.Only slight quibble was the time for desserts to arrive.But it wasnt a problem.Wonderful place.The staff are fantastic. We complained about the food but being short of time there was no chance to rectify it.A long time before we try it again. The seating in the conservatory is very close together and several times my wife and myself were bumped into by the waiting staff which did not make for a peaceful meal. The beer battered onion rings were so greasy that after 2 we just could not eat any more, there was at least a quarter of an inch of oil in the bottom of the bowl they came in. We visited Saturday night, our food came in good time however it was stone cold, we ordered a burger and 2 cod and chips that were all cold. We couldn’t be bothered to send back because we were all so hungry. The garlic pizza bread was rock hard. The puddings took forever to arrive and the apple crumble the pieces of apple was hard. I work in the industry myself so I understand what it’s loke when it’s busy but the service took forever when more tables began to arrive. We then asked for the bill which hadn’t had our drinks added on even though we had asked twice for our bar tab to be moved over. We then had drinks brought to our table which we hadn’t ordered. I’m guessing the staff just guessed our drinks bill and put it through because they couldn’t find it. We then got fed up of waiting to pay and paid at the bar. The lady behind the bar was a little rude, over all to pay nearly 35 pound each for a meal that was cold and the wait for puddings was a joke. We will be back for drinks but not for food. Good service, friendly staff and good food.